This weekend, we're excited to be adding a new type of event and offering DOUBLE EXP across all modes. In addition to the weekly co-op rotation and monthly PVP league we are also going to debut limited run PVP events with special rules. Additionally, securing a victory under these rulesets will award a specific thematically relevant reward card. We have several of these rule bending experiences lined up throughout April, but we’re kicking things off this very weekend - April 12th through until April 16th. And what is the first theme, you ask? As many of you may have noticed in our card art, we're suckers for a good moustache so how best to celebrate that...? Our first PVP event with a special rule bestows an extra +2/+2 buff on any unit with a moustache upon hitting the board. The hairy action is all taking place in the bristly hallows of Rosewood. 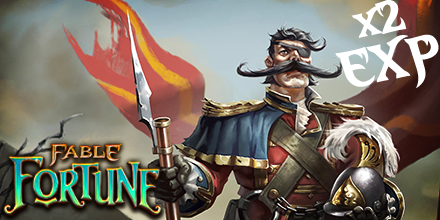 Secure a victory with your hairy faced battalion to secure a copy of the card ‘Royal Tactician’ in all his moustache twiddling glory. Watch this space for announcements on the forthcoming events in more detail! As always, sound off in the comments to let us know what you think. And keep an eye out on http://www.fable-fortune.com, as well as our Facebook and Twitter.